Until the 18th century, most houses in what is now the United Kingdom were either made from stone or wood and clay. The latter type would use bricks for chimneys to reduce the risk of fire. Little used in the UK before the 14th century, bricks rose in popularity when Flemish refugees brought bricks into East Anglia. Their use spread and by the late 18th century, yellow 'stocks' became common in London. In the 18th century, bricks started to be used for all parts of smaller houses. A brick tax was introduced 1784 and increased in 1794 and 1803. This slowed the trend but after the tax was repealed in 1850 bricks were used almost universally outside the stone areas. 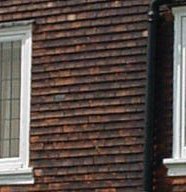 During the period of the tax, one alternative to wooden weatherboarding was the 'brick tile' or 'mathematical tile'; these were tiles in which the surface exposed below the tile in the course above was shaped like a brick. During the 18th century, as well as being taxed, bricks were also less fashionable; stucco was used to simulate stonework. Stucco frontages ceased to be used in London in the 1850s, being replaced by brick as the desirable material. By the late 19th century, red bricks were cheaper and could be used for the public side of houses, yellows being relegated to the rear. Using a mix of types of brick in the same wall reached its peak in the Victorian Gothic revival. 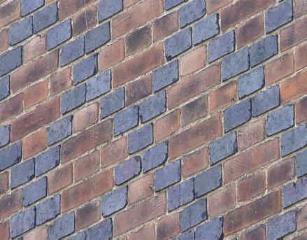 'Frogging', the indentation on the top of a brick helping the mortar key onto the brick, was introduced in the 1850s. For much of this period, bricks were made locally; their colour was influenced by the clays and other materials used, and by the temperature at which they were fired. The coming of the railways meant that bricks could be distributed more widely and greater uniformity resulted. The finest bricks are 'rubbed' or ground to fit tightly with little mortar. This could be imitated by staining the mortar to match the bricks, and then setting a line of 'putty' into a groove cut in the mortar as it sets. If you are looking for a new career, learn this 'tuck-pointing' technique as you will soon be wealthy! Bricks were made from clay which had been puddled, ie squeezed and blended, until it was smooth and impurities had been removed. Other materials were mixed in, such as chalk or ash, and once moulded could be placed in sand when still damp. Shaping could be done with a mould, by extrusion through a wire mesh, or by carving. The bricks were then baked in a clamp or kiln. A clamp is a stack of dried bricks, with faggots of brushwood inside, and coated with clay. The Hoffman kiln was introduced in 1858; this made continuous production possible and the bricks were uniform in shape and strength. Until 1800, most bricks were red from the iron in the clay used. Palladian ideals led to the development of 'white' bricks, in which lime changed the brick to pale yellow, buff, or brown. A whitish brick made from Gault clay was used widely in the south-east of England outside London. Brown bricks were made and used in the Thames valley. A silver-grey brick can be seen in south Oxfordshire, Berkshire and Hampshire. In the Vale of York, a dark brown brick was produced. As red bricks were re-introduced from the 1870s, they were expensive and so the most basic houses still used only yellow bricks; more expensive houses used reds just for decoration such as over windows. As the cost declined further, the front elevation was built entirely in reds. Other colours were produced by the addition of cobalt, manganese and sand. If the brick was baked in the hottest part of the clamp or kiln it would often be darker or change colour through vitrification. For example, if a red brick is fired at very high temperatures, a blue or blue-black brick results. 'Stock', 'brindle', 'diaper', 'faience', 'bond', 'gault', 'tuck-pointing', 'header', 'fletton'; the language of bricks gives the lie to any suggestion that bricks are simple. But to any of us in a brick-built house, some understanding can help us to care for them. These soft, porous bricks were made from clay close to London. They were baked over a bed of coke for 10 to 12 weeks. The black flecks in the brick come from the ash mixed with the clay; this burns, firing the bricks internally. South-east of England, particularly in Ipswich, Cambridgeshire, the Isle of Ely, Peterborough, Huntingdon, Bedfordshire, Maidstone, and the south coast. A whitish brick made from Gault and the adjacent Jurassic and Pleistocene clays in the south-east of England, coloured with chalk. These dark, purple-blue bricks were burnt in a kiln at 1200 degrees Centigrade, making a very strong, dense and impervious brick. They are often called 'engineering bricks'. They were made by 1832, but the coming of the canals made their more widespread use possible. These are a dense red brick. Now called 'Tudor Reds', these were a high quality, kiln-fired, sand-faced brick used as 'rubbers'. Made in the East Midlands from about 1900, a blotchy pink self-firing brick often used for internal walls. Flettons are pressed, in a mould. A brown-purple brick with a striped pattern. A soft brick used for internal walls. As well as the standard, regular brick, typically 8¾ inches by 4 and 3/16ths by 2¾, shaped bricks are used for cappings, window reveals and sills. Terracotta is a mix of fine sand and pulverised brick or burnt clay. The moulded block was then dried and fired in a kiln. Much terracotta is unglazed and pervious. Sometimes the firing gave a hard, impervious, vitreous glaze. Full or matt-glazed terracotta is called 'faience', and achieved by adding a glaze or enamel. By the 1880's, new colours were available, in addition to the previous choices of red and buff. The foundations, or brick footings, were typically three brick lengths at the base; 680mm - i.e. 3 x 215mm (8.5 inches), stepped up to the wall. By 1890, poured concrete was often used, with the stepped footings on top. The bond of the brickwork in which the bricks are placed in a pattern of headers and stretchers gives the wall strength and stability. Stretcher bond is only suitable for a single skin; in a modern house the inner skin is typically made from blocks, fixed to the outer brick skin by metal ties. English bond was not popular in the Victorian period. So the common bond is Flemish, with the alternate header-stretcher pattern. Bricks are 'glued' together with mortar; until the 1920s, this was usually just a mix of sharp sand and lime. This is porous, flexible and matches the typically soft bricks it was used with. Cement has gradually taken the place of lime; it is much harder and largely impervious to water. It suits modern bricks which are much harder. However, roughcast and pebbledash finishes were common, particularly to cover cheaper bricks, and later for more decorative purposes. Roughcast is a mixture of shingle or crushed stone and sand mixed with a cement. To achieve a pebbledash finish, the wall is first coated with cement, and then pea shingle or some other fine stone chippings are thrown onto the soft cement. Another treatment common, after the 1870s in Gothic and Arts and Crafts styles, is tile or slate-hanging.